Many common stove types and styles for the home are available in scaled-up versions for farm, shop and ranch applications. With increased size efficiency improvements are possible, both in terms of operation and utilization of the energy stored in the wood. In addition to larger stoves, agricultural and commercial applications may be better able to take advantage of hydronic heaters, which utilize wood to heat water. Agricultural and commercial applications that demand both space heat and domestic hot water in close proximity can more readily use large amounts of water to store and transport heat. They can take advantage of the fact that wood fires burn most efficiently and cleanly at higher temperatures, and store heat that is not immediately used (excess heat) in storage tanks. The most commonly available form of hydronic systems today are outdoor wood boilers that burn cordwood. The best use of outdoor boiler technology is for “mini district heating,” where multiple buildings are heated from a centrally located boiler. An example could be a farming operation where there is a need to heat outbuildings or machine shops near the house. Hydronic systems use water or antifreeze to transport heat from the wood boiler to the point of use. In the house, the heat typically circulates around the house as baseboard hot water or radiant floor heat. The boiler heat can also feed into a heat exchanger that blows air through fins for a forced-air system, which is more common in the farm buildings. Outdoor wood boilers have gained a bad reputation for inefficiency and creating air pollution, particularly during start-up. While most of these problems are inherent in their design (primarily due to the use of a water-jacket around the burn chamber, which is good for heat transfer, but keeps the temperature too low for complete and efficient combustion), new advanced technology boilers promise some relief. 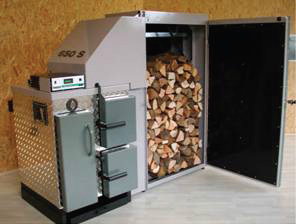 Other developments include a cordwood boiler with a hopper that automatically loads the firewood, http://goo.gl/3xYzL. EPA’s Hydronic Heater program Phase 2 units have a white tag and are about 90 percent cleaner than unqualified units. EPA’s Phase 1 models are no longer considered “qualified” under the program. Wood-burning appliances that are “qualified” under the EPA’s Voluntary Hydronic Heater and Fireplace Program are NOT “certified” per EPA’s New Source Performance Standard for New Residential Wood Heaters. Other systems applicable to agricultural operations include hog fuel/wood chip as well as pellet boilers. The former are more commonly found in commercial and industrialscale applications, like sawmills and district heating plants, but they are also used in school and hospital settings. While smaller installations of woodchip boilers are possible as well, pellets might be a more suitable option. The physical characteristics of wood pellets, like size, shape and density, resemble those of grains more than any other fuel source, which makes their handling very similar as well. They can be transported in bulk on trucks and trailers, augured and blown, as well as delivered and stored in grain bin-like containers. The most compact units come as a turn-key kit readily assembled in a container, complete with controls, combustion unit, air handlers, pumps and conveyers. On-site set-up is reduced to connecting the pellet storage bin, power and waterlines. If considering heating multiple, clustered buildings, like on a farm, ranch, small community, or resort, consult a knowledgeable installer. Wood may provide a renewable and relatively price stable heating fuel that integrates well with your current operations and utilizes locally available labor and resources.